Ethel Flowers Kendrick, known affectionately to generations of Erath residents as “Mama K”, was born in New Orleans on May 11, 1923. She was the daughter of Emory and Celine Dupre Flowers. Mama K was married to Travis Kendrick for 63 years. They raised a foster son, M.C. Trahan (married to Marilyn Melancon). They were the grandparents of three, Paul, Elise, and John Travis. 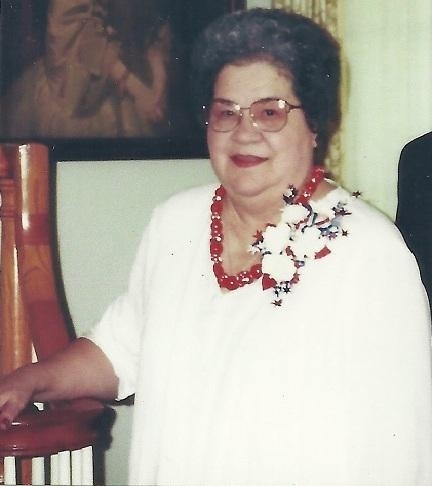 She was a longtime resident of Erath, and was a graduate of Erath High School. She earned a B.A. degree at SLI (now UL Lafayette) and began teaching in 1944 at Erath High School. She obtained her M.Ed. degree in 1965. She taught at every grade level, except second and third, in elementary school. She also taught girl’s health and physical education for grades seven through twelve. In the last six years of her teaching career, she was a guidance counselor at Youngsville Elementary and Erath. She began the high school girls’ physical education program under the administration of Henry Bernard Jr. in 1951. Basketball and softball were the favorite sports for Mrs. Kendrick, not as a player, but as the Erath Bobkitten coach. She coached softball for eight years, 1944-47 and 1951-56. She also coached basketball from 1951 to 1960. Mrs. Kendrick served as Erath High cheerleaders sponsor for several years. She also served as official scorer for the boys’ basketball, football and track teams. Mrs. Kendrick left retirement in 2000 to serve as guidance counselor for Henry Elementary and Dozier Elementary in Erath. Mrs. Kendrick was a member of AARP, the National Retired Teachers Association, the Louisiana Retired Teachers Association, the Vermilion Parish Retired Teachers Association – where she served as treasurer, the Erath Backers Club, and served on the Board of Directors of Bares Ranch. Mrs. Kendrick passed away at the age of 84.